In a way, you could say beer was the original “health” beverage. Before sanitation and quality plumbing, a fermented drink was the only thing you could be sure wouldn’t get you sick. And, while it’s somewhat apocryphal that medieval people only drank beer—there were plenty of clean streams and even as early as the 1200s, when London was working on quality water pipe systems—they did drink a lot of it. At the least, it was an easy way to get calories and rehydrate. Of course, these days, beer is seen as anything but healthy. Plenty of healthy people drink it, but no one is out there acting like it’s the reason they are trim and vigorous. Too much beer causes obesity and cirrhosis and certain cancers and greatly heightens your chances of ordering buffalo wings late at night. Even so, throughout the last century, many breweries have still tried to release a “health” beer. 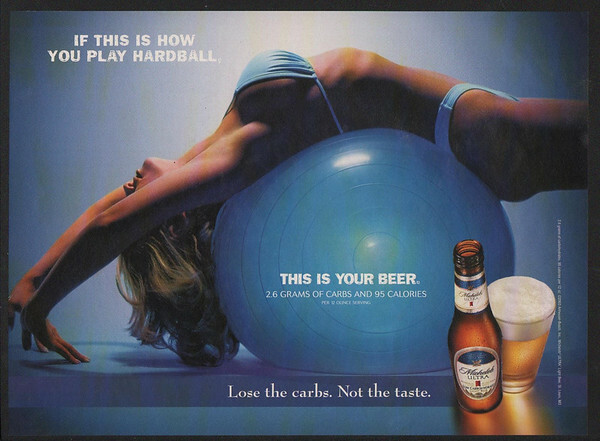 Whether that meant adding vitamins or proteins, or playing up electrolyte qualities, for the most part, the history of “health” beers has been a history of ambitious flops...with one notable exception. While never designed as a health beer per se, by as early as 1929, the Irish brewery had an advertising slogan touting that “Guinness is good for you.” They never exactly spelled out what that meant—the slogan was more based on its consumers' already-held beliefs. Guinness does, in fact, have more folate (Vitamin B) that your average beer, which perhaps led to their other famous slogan, “Guinness for strength.” Likewise, there’s a history in Ireland of new moms in the maternity ward receiving a bottle a day to help with breastfeeding and, indeed, Guinness does stimulate lactation (but most beers do that). While today, the company readily admits there’s no real health benefits inherent in their product, it reamins a much lower-calorie beverage than you’d expect, a mere 125 calories per 12 ounces. Vitamins were discovered in 1912 and Americans, of course, found a need to start cramming them into anything and everything. Beer was no exception. Schlitz was the first brand ever offered in a crown-topped can in 1935, and a year later they added a most intriguing brand extension. A vitamin researcher at the nearby University of Wisconsin had recently discovered that UV light could increase the Vitamin D content in food. With that technology, Joseph Schlitz Brewing’s Sunshine Vitamin D beer hit the market in mid-1936, though not without controversy. Biochemist Harry Steenbock initially advised against the company using his patent for such iffy health practices, before eventually relenting, writing “it may do some good and it most certainly will not do any harm.” The ad copy was a little more brash, noting: “To help retain the peak of sunny summer health—to help maintain rugged resistance to winter colds and sickness—drink Schlitz, with Sunshine Vitamin D.” Whether it was actually healthful, who knows, as the product was pulled from market in 1938 due to its unpopularity. Gatorade was the world’s first sports drink, created by scientists at the University of Florida in 1965 to assist their Gator football team. After it supposedly aided in the team winning the 1967 Orange Bowl, the rest of the world started clamoring for it. Like anything drinkable, almost immediately, people began using it as an alcohol mixer. Enter the Pittsburgh Brewing Company who, in 1969, tried to capitalize on this trend. They introduced Hop’n Gator, listed as a “lemon-lime lager,” but really just a combination Gatorade and lager shandy. It was actually engineered by Robert Cade, who had headed up the original Florida lab team. It was a flop almost immediately, selling poorly, hydrating no one, despite ads that claimed it “Quenches like liquid lightning.” It was discontinued in 1975, briefly reappearing in a limited run in 2004. Though gimmicky “health” beers are mostly an American phenomenon, one of the more interesting examples of the genre came out of India. Created by alternative medicines doctor B Srinivas Amarnath, Bio Beer contained “bio concentrates” such as aloe vera and ashwagandha, which the brewery claimed prevented the beer from harming the liver and causing ulcers. One of the more alcoholic health beers ever made, a “Super Strong” version clocked in at 8% ABV. This Dallas brewery released what they claimed was the country’s first government-approved vitamin-enhanced beer (Schlitz Sunshine, we hardly knew ye). It was formulated by the legendary inventor of light beer, Dr. Joseph Owades. It had a tagline of “Be Smart. Drink Smart.” They enlisted then-falling pop star Jessica Simpson as their spokesperson and had misogynistic commercials. So why did it fail? It was eventually learned that this beer was vitamin-enhanced with just a few more B vitamins than your average lager—and about the same amount as a Vitamin Water. It was soon off the market. But never fear, as Jessica Simpson once said, “Yes, I work out and take care of myself. But I also like a cold beer once in a while.” Wise words. Perhaps the most low-cal beer (77) ever released, this gluten-free “lager ale” (an obvious paradox) came from the Canadian brewing company Vampt Beverage. Supposedly infused with vitamins, antioxidants, a “proprietary” protein and electrolytes (courtesy of raised salt levels), it was promoted as helping replenish the body after a tough workout. Sold in slender, Red Bull-esque cans, Lean Machine came in several flavors such as Lemon Ale Hefeweizen. Hilariously, the “beer” was a pathetic 0.5% ABV, which is low enough to make it a non-alcoholic beer by many countries’ standards. Eventually, people must have realized that all beer has some electrolytes—and most will actually get you buzzed too. The product flopped, and today someone is squatting on their old website. Created by some Boston-area medical device company coworkers who enjoyed finishing a tennis match with a few brews, they decided to design the world’s first protein-packed beer. Quitting their jobs and basing their brewery operations out of a WeWork, they contract-brewed their first batches at Von Trapp Brewery in Vermont. They opted for an “ultra-premium hydrolyzed whey protein” in their two initial offerings, one a Vienna lager, the other a light beer. Though the beers got a lot of initial press, and sold out in Boston within 24 hours, eventually the brewery pivoted to more traditional “unhealthy” offerings. Today they sell a New England IPA like everyone else. The most successful health beer ever made—hell, one of the most successful beers ever made—is this lowest of low-cal offerings (a mere 95). Launched during the height of the Atkins Diet craze and low-carb popularity, its ads have always focused on physical fitness, depicting bikers and joggers and six-pack abs and whatever the hell this is. They sponsor triathlons! Lance Armstrong was once a spokesperson! Even if most people readily admit it mostly tastes like water—and it’ll take a ton of the 4.2% ABV offering to getcha drunk—its popularity has soared in a way few other macro-beers have during the modern craft beer era. Even as Anheuser-Busch InBev’s other products have been trending downward in sales, Ultra has been up a whopping 27% over the last three years. Now, if they could only figure out how to cram some vitamins in there.